So I know we've been discharged for awhile, and "Home" would probably be a more appropriate title... but I've waited a LONG time to write those words in a blog title! I swear I’ve started this blog post several times, but I either don’t save it properly or had much time to work on it. Then everyday, I get further and further behind and the task has become somewhat daunting. The last real blog post/medical update was back at the beginning of September, and we’ve made some major progress and hit some awesome milestones since then. The biggest is obviously our DISCHARGE on November 9!! That’s right, we are officially HOME, and this admission has finally come to an end. We obviously still have a long way to go in Evanna’s recovery, and unfortunately Evanna has several surgeries and procedure in her future, but right now, Nick and I are just savouring this moment and trying to not get caught up when thinking about the future. I just want to quickly highlight some of the major milestones that haven’t been documented here on the blog and relive some of the awesome moments we had. So since that last real update, Evanna was successfully transitioned from NJ to NG feeding. For almost an entire year, Evanna has been kept NJ feed for safety purposes while she was intubated, and then there never seemed to be a right moment to transition her, as something would happen (infections, surgeries, procedures, etc) to delay it. Finally once Evanna became line free and completely off sedation medication (withdrawals didn’t help either…. ), we were in a good spot to make the transition. With Evanna we can never do anything quickly, so I set out a plan to go nice and slow. Well, it did work, but we had to make tweaks along the way… due to the fact that Evanna was handling the transition well, but was becoming a “hangry” baby, we did speed up how fast we were increasing the amount of food we were giving her towards the end. Normally you would titrate the NJ feeds down while increasing the NG feeds, but for some reason, Evanna’s tummy doesn’t like 2 tubes going through it, so we had to completely stop NJ feeds, pull the tube and just feed Evanna through her NG. Overall, it was a stressful few days, and it was almost as painful as watching a baby go through withdrawals, but all was well once we reached full feeds and Evanna was able to rest comfortably (it’s moments like this where I wish you could reason with a baby lol). The first week of October was a busy one for us. First I held a little party to celebrate #EvannasHeartHospitalversary. Many heart families celebrate the anniversary of their child’s first open heart surgery, but because we were still hospital, I felt it was important to celebrate BOTH milestones. It’s not very common for a child to spend an ENTIRE year in hospital (it does happen, but again, it’s not something you hear about everyday), so not only did I want to celebrate the one-year mark since Evanna’s first major OHS, but also our journey and everything that our family went through. It had been an incredibly hard year for Nick and I, and while it could have easily broken us, it only made our bond stronger. While I was proud of how well Nick and I endured, the night before October 6 was incredibly emotional for me. Our first year as family should have been spent making fun memories, but instead it was spent by our child’s bedside while she recovered from surgery after surgery and complication after complication. There were days that I hated social media, because while my friends were enjoying the holidays and family traditions, Evanna was intubated and fighting for her life. At times I hated “how unfair” our life was and was very angry at our predicament, but thankfully those moments were few and far in between. As weird as it sounds, I needed to celebrate this milestone, otherwise I might have done the opposite. I had a special crown made for Evanna, invited our close friends and family, and arranged for a special cake to be made through an organization called Icing Smiles (blog post to come). It was a great afternoon, and it was great to see some people that I hadn’t seen in a very long time. A few days after the party, Evanna finally went for a little trip back to the ICU for a trach transition. 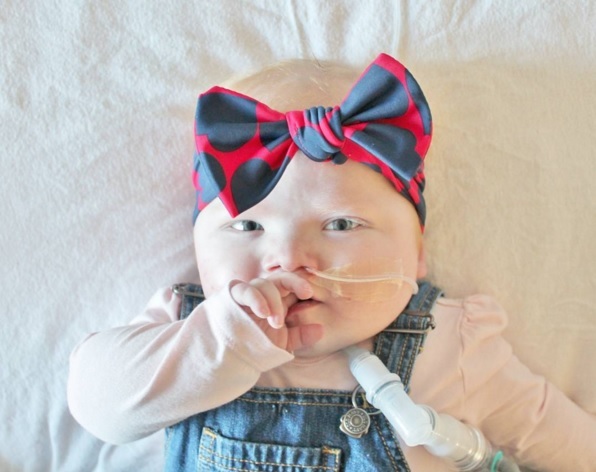 When we initially came out of ICU, they told us that out biggest hurdle towards taking Evanna home was the fact that Evanna had a cuffed trach. They really don’t like to send kids with cuffed trach’s home (not impossible, but something they like to avoid if at all possible), so it was decided that once Evanna was stable and spent a month out of ICU that we would try and switch Evanna to a cuffless trach and see how she would handle it. Well, we tried to do it at the end of September, but due to a bed shortage in the ICU and then Evanna’s party, it got held off until October 5. I often get people telling me that things will happen when they’re suppose too, and more often than not, it ends up being true. On the eve of October 6 (our Heartiversary), and on Day 365 in hospital, we took Evanna back down to the ICU and try to transition Evanna to a cuffless trach. We originally planned to spend at least 24 hours in the ICU to give the RT’s some time to fiddle with her settings, but within 6 hours of the trach change and no fiddling required, the intensivist stated that Evanna was doing just fine and didn’t really need to be in the ICU any longer. So once the resident completed the paperwork, Evanna was taken back up to Unit 2 later that night, and all was well. After Evanna’s trach transition, we had a big meeting with her medical team to discuss where to go from here. Just before Evanna transitioned out of the ICU at the end of August, we had this huge transfer meeting, and it was discussed that Evanna would most likely not be discharged until closer to Christmas, and even that wasn’t a guarantee. However, due to how well the trach change went and how uneventful the whole process was, it was decided that maybe Evanna was ready to go home. Yes, there were still some small issues, but none that were big enough to keep us in hospital anymore, and so it was time to really work towards discharge. When it came time to pick a time frame, they asked for our opinion, and I asked if mid to late November was appropriate, to which they responded with yes. You see, with a trach (and vented) baby, discharging for the first time is not a quick process – Nick and I needed to make sure we were fully trained to take care of her, we had to proper equipment in our home, and have staff (who were also properly trained) in place to watch and take care of her at night time. This we were told would be our next biggest hurdle, but I was not about to let that stop us from bringing Evanna home. Over the past year, Evanna has garnered a little bit of an audience that just absolutely adores her and so I decided to use that attention to help us find nurses! Nick and I decided to do “self managed care”, which is an option here in Alberta that puts me and Nick in charge of who takes care of our daughter (yup – that’s right, we essentially are bosses, hire and train whomever we want), but are funded through Alberta Health Services (which means based on Evanna’s needs, we’re given a certain amount to pay for night nursing plus a little extra for day respite care). So I put an ad up on the internet, and pleaded for people to spread the word and share that we were looking for nurses – and it actually worked! Within a day, I had several resumes in my inbox, and by the end of the week, I roughly had 50 great resumes of people wanting to care for our little girl. It was actually a little overwhelming, and became an emotional process… over the past year, Nick and I felt like we only experienced setback after setback, and for once things seemed to being moving forward at a quicker rate and without any hiccups (so yes I cried, but because I was so happy and was feeling so blessed). A one-point Nick even asked me if this was really happening and if I thought Evanna was actually going to come home this time – to which I smiled and said “yes”. There were times where we would avoid using certain words like “home” and “discharge”, as we felt it always jinxed the situation, but I was so confident that “this was it”, that I used those words with confidence. Now don’t get me wrong, the last few weeks before our tentative discharge date were filled with mini hurdles and a todo list that was a mile long, but we didn’t let that stop us, and we hit the ground running. We both got our CPR done (Nick needed to get re-certified for work anyways, so it was like killing two birds with one stone), our trach training completed (trach changes, suctioning, bagging, etc), NG/food pump training, vendors in place (fun fact that I haven’t been too public with on Evanna's FB page or my IG account – but my Uncle actually owns a large oxygen vendor company here in Alberta… so lets just say that he has made sure we’ve been well taken care of and a great support to our family through this entire journey/process. It’s been surreal that a company I grew up with is now in my HOME keeping my child alive! ), staff hired and trained. Our timeline of mid to late November was actually pushed UP to the beginning of November, and I was getting my birthday wish of having my daughter home! 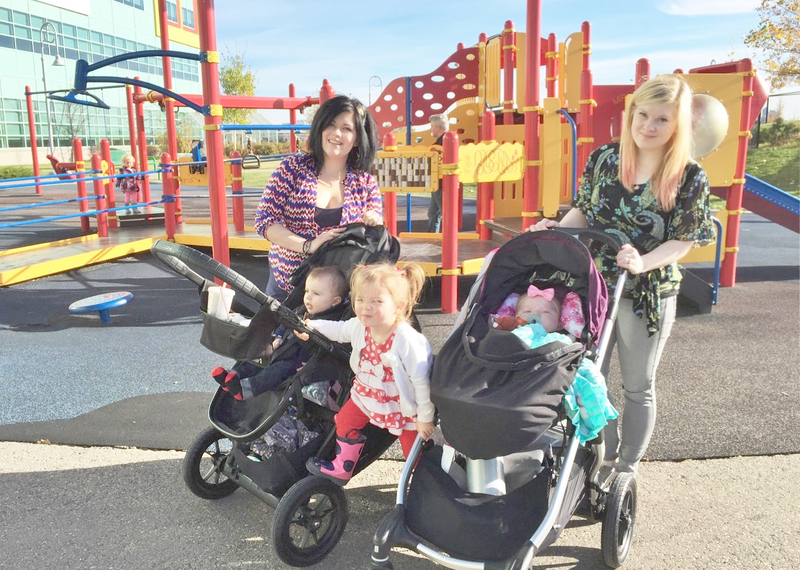 We began to get more and more freedom within the hospital (even taking Evanna on unaccompanied walks around the hospital was a big deal in the beginning) and we even began to plan day passes to take Evanna out of the hospital and have a few quick trips home. Now it just wouldn’t be right if we didn’t experience any hiccups towards the end, even up until the last weekend in hospital, and we unfortunately had to put up a small fight and convince Evanna’s medical team that not only was Evanna ready to come home, but that Nick and I were more than capable of handling her and had the proper experience and knowledge to take care of her. In both the discharge meeting and several side conversations, it was reiterated several times to us that Evanna is one of the more complex cases that has come their way in recent years (complex heart + complex airway = complex mess), and her safety was super important to them. While we were grateful for their concerns, and that they truly cared for our daughter, Nick and I began to see the hospital as a detrimental place and was beginning to hinder her progress. The biggest issue we had was with certain people not responding to Evanna appropriately when she was upset. When a trach and vented baby desats, they have a certain protocol that they follow to bring that child out of that desat – however, Evanna being first and foremost a CARDIAC baby, those rules for the most part do not apply, and if anything, it can make her angrier, desat further and take a longer time to recover. They began to discuss these as “episodes” or “events”, but funny thing was they never happened when Nick or I were there, and it was because when something was making Evanna angry, we were there to catch it, deal with it quickly, and in the appropriate manner. Whenever Evanna is having a desat, Nick and I know exactly what to do and never make a big deal out of it (ie. tell the nurse or make the medical team aware) because like with many cardiac babies, the best way to handle it is to calm the child down and support them through the “event”. Anyways, it became this whole ordeal, and it was frustrating because we couldn’t be there all the time and handle Evanna’s “episodes”. **I would like to clarify that it sounds a lot worse than it really is. 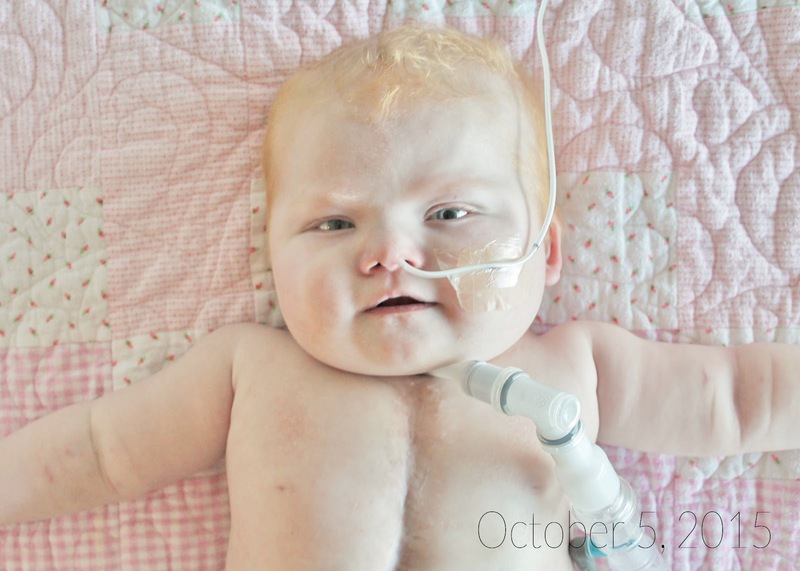 Evanna is just being like any other heart baby with a VSD – when she gets mad or angry, cries and doesn’t take nice deep breaths, her heart will shunt, which means her oxygenated and deoxygenated blood mixes more than usual, and the deoxygenated blood gets circulated throughout her body. Then you bring a stranger into the situation who doesn’t know Evanna’s likes and dislikes, and can make her even angrier, and therefore a longer and more severe desat. Overall, Evanna is just unique in that she has lower oxygen saturations to begin with, is hooked up to a monitor, and so when she’s angry, her numbers can freak people out. 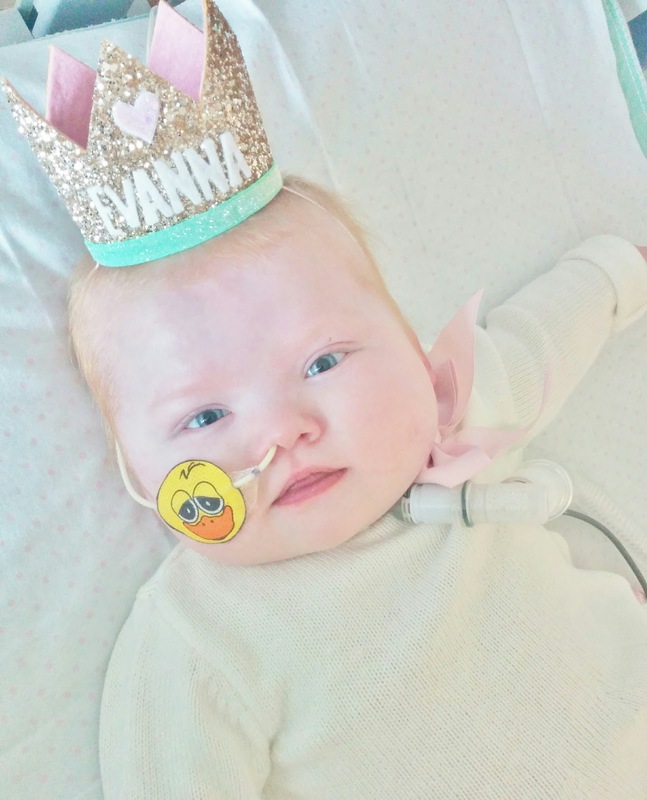 It’s hard for some people to wrap their head around the fact that when trying to get Evanna’s numbers to come back up, they can’t treat her like a respiratory baby (which you can PHYSICALLY see with her trach and vent), but must treat her like a cardiac baby (which you can’t really see on outside as it’s less obvious). At the end of the day, we knew it was time to get Evanna home, because the hospital wasn’t the safest place for her anymore, and that things were beginning to shift and our home would be a safer place for her under our watchful eyes of people who truly knew Evanna best. Finally, on November 9, we packed up Evanna’s final belongings and walked out those hospital doors! Well, technically we made a stop in the PICU, as when we transferred out of the ICU back in August, they asked if we could stop by before we actually went home on discharge day. Evanna spent a total of 13 months in hospital, but 11 of those months was spent between the Stollery and ACH’s PICU’s, and so we had built some major relationships with the staff between those two units. The timing was actually quite perfect – Dr. Mahoney happened to be working! She was the intensivist who pretty much saved Evanna’s life on Canada Day when she went into Septic Shock, and both Nick and I felt that it was perfect that she got to be the one to see us off, and be the final “medical” person that we saw before we walked out of those doors. So, what have we been up too since we’ve been home? Well for the most part we’ve been trying to just catch our breath, work out the kinks, find a system, and get into a grove. After a year of our life being put on hold, we’re just trying to regain some normalcy and pick up where we left off. So what does that mean? Well, I’m actually to returning to work after Christmas part-time, but made it so I only work around Nick’s schedule. We also bought and are in the process of building a new house! While the timing hasn’t been the best (the day we got a quicker discharge date for Evanna, happened to be the same day we put on a hold on the lot), but if we didn’t act when we did, we would have lost out on this particular opportunity. We’ve actually been looking for a new house since Evanna transferred back to Calgary at the end of June, and I was hoping to move before Evanna came home, but nothing we found was within our price range nor had what we were looking for. At one point did find a great property with potential, but it sold before we even got a chance to look at it and I was so bummed out, however, turns out that an even better house was waiting for us, and I saw that things were working out the way they’re suppose too. Anyways, we don’t get possession until late summer, so other than attending a few house appointments here and there (like picking out floors and cupboards), it’s not really on our radar, as we have other things that consuming our attention right now. Ahh – feels so good to be caught up! I have a few blog posts planned (ie. Evanna’s New “Nursery” Reveal, Icing Smiles, etc), and a few blogging projects I wanted to get done, but I felt I couldn’t commit to anything until I was at least caught up here. Thanks for reading, following along and keeping our little family in your thoughts and prayers!